Matt Stafford: more than “a good guy with a great arm”? … The coaches at Georgia have continued to tell Stafford that big plays are not always going to win the game and make him an accurate, reliable quarterback. He said he is getting the message. Like I said, perhaps I read too much into that, but could you imagine any coach saying that he had to gimmick the playcalling to keep David Greene interested? Matt’s a wonderfully gifted physical talent. I guess we hope this is the year that the rest of the package catches up. It’s scary to think what a fully engaged Stafford might be capable of. 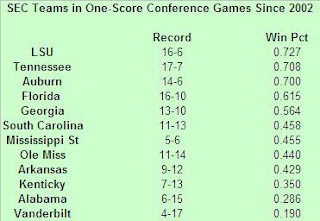 As noted in the previous post, since 2002 Georgia is 13-10 in one score conference regular season games, which isn’t bad, but is certainly a lower winning percentage than the overall one during Richt’s tenure. Curiosity has gotten the better of me, so I went back over the records from ’02 forward to see if there was any pattern to Georgia’s play in these types of games. It turns out there are a few. Interestingly enough, that notable difference in record depending on whether the Dawgs broke the 20 point mark in a game isn’t reflected in a similar way on the defensive side. Georgia was 7-5 in these games when it held the opponent to less than 20 points; it was 6-5 in the remaining games. I know a win’s a win and all that. But that road record is an amazing stat. Georgia residents, relax. Evidently our state isn’t the only jurisdiction where the government is forced to grapple with the most troubling issue of our times: car tags extolling support for an enemy school. When we checked that was the only unit with a tag like that and it has been removed. Thank you for bringing it to my attention. “A tag like that”. He can’t even bring himself to say the “A” word. My friends, America is a great country. Stats Geek! Looking backwards and forwards at the SEC. Matt Melton, at his excellent site Statistically Speaking, has his analysis up of last year’s conference play, along with some thoughts about which schools will rise and which will fall in 2008. It’s a long, but rewarding read. The mean points scored and allowed for all SEC teams in conference play (Championship Game excluded) was 217.17 points. The standard deviation for points scored was 59.56. The standard deviation for points allowed was 38.15. South Carolina scored 205 points in SEC play and allowed 227. Their offensive SDPI was -0.20 = ([205-217.17]/59.56). Their defensive SDPI was -0.26 = ([217.17-227]/38.15). Their total SDPI for points (SDPIP) was -0.46 which ranked 8th in the conference. The mean yardage for and against for all SEC teams in conference play was 2926.75 yards. The standard deviation for yardage for was 395.45. The standard deviation for yards allowed was 311.52. South Carolina gained 2975 yards in conference play and allowed 3117. Their offensive SDPI was 0.12 = ([2975-2926.75]/395.45). Their defensive SDPI was -0.61 = ([2926.75-3117]/311.52). Their total SDPI for yards (SDPIY) was -0.49 which ranked 8th in the conference. All of which boils down to South Carolina was a mediocre team in conference play last year. It’s not bad, but it’s clearly not first tier. I had thought that given the school’s overall record – and its excellent road record, in particular – under Richt, that this would be a comparable area of excellence. … The Dogs also bring back their fair share of skill position players: Matthew Stafford, Knowshon Moreno, and Mohamed Massaquoi as they look to return to the SEC Championship Game for the 4th time in 8 seasons under Mark Richt. But their real strength last season was the defense. In fact the offense was below average in terms of yards gained relative to other SEC teams. [Emphasis added.] To take the SEC East this season, they need some offensive improvement; in particular some improved quarterback play. The much ballyhooed Stafford finished 91st in the NCAA in completion percentage (55.7%) and 56th in passing efficiency (128.92). No doubt Georgia benefited from its +9 turnover margin (only +1 in conference play, though) in ’07.